Cadet recruits march to the next station during a day of tests and obstacle courses at UNG's Pine Valley facility. With the influx of 221 new recruits who have completed the traditional FROG Week training at the University of North Georgia (UNG), the Corps of Cadets strength stands at 775 as the fall semester begins. New cadets began with in-processing on Aug. 14 and ended with the traditional Crown Mountain Run and FROG Week graduation on Aug. 20. The 3.1-mile trek to the highest point in Dahlonega was the final test; after completing the run, the recruits recited the Boar's Head Brigade creed and were FROGs no more. This semester, the recruits also were visited by Brig. Gen. Joe Jarrard, adjutant general of the Georgia Department of Defense and a UNG alumnus. 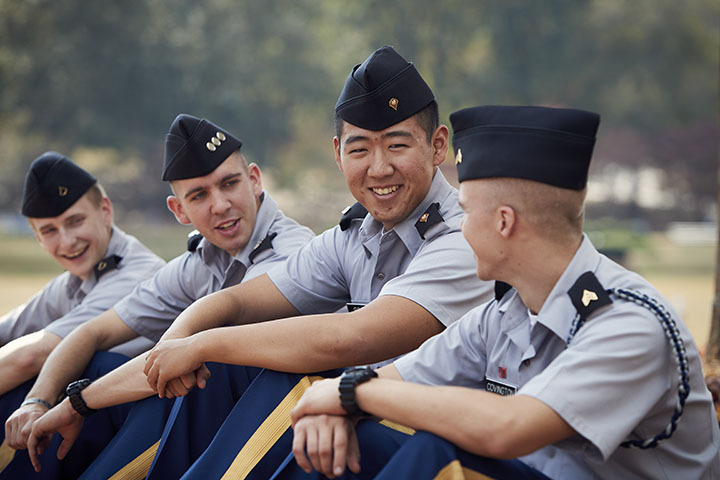 The seven-day program, which every UNG cadet recruit must complete, helps the new cadets learn how to balance corps duties with academic responsibilities. "FROG Week is a military orientation program that helps all new cadets start off on the right foot. It's the first step to becoming a good cadet," retired Maj. Richard Neikirk, assistant commandant, said. "We show them that this is a disciplined environment where everybody is treated the same way, and teach them teamwork and the basic structure of a military environment." Cadet Capt. Larry Keith Glover III, a senior from Athens, Georgia, majoring in physical education, is a prior-service member of the Corps of Cadets attending UNG on a Green to Gold Scholarship. During this fall semester's FROG Week, he was in charge of the obstacle and ropes course activities at UNG's Pine Valley facility. "We're not here to just give these cadets some good physical activity, we're actually trying to build them as an individual and as a team – creating camaraderie," Glover said, adding that failure on some tasks is to be expected. "You're never going to be perfect – it's how you recover and how you react that really defines who you are. When you fall down, how fast do you get back up? That's what builds your character." FROG Week also serves as a training exercise for current cadets like Glover. 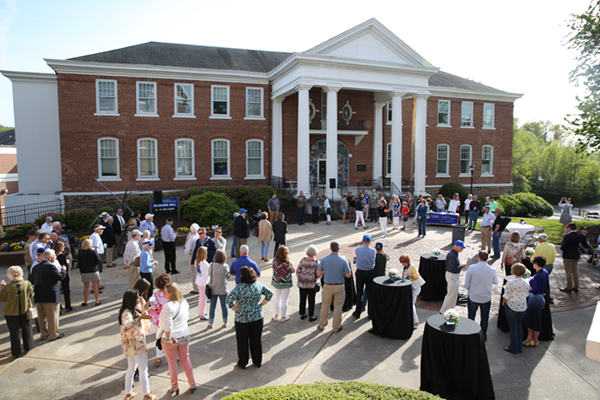 Like many corps events and activities, UNG cadets plan and execute FROG Week, with oversight from Commandant of Cadets staff and Department of Military Science instructors. Glover served three years in aviation with the Army's 3rd Infantry Division and was deployed to Afghanistan in a combat role, but said he has learned much from coordinating events like FROG Week. "It doesn't matter if you're a four-star general … you're always a student of leadership," he said. "I've learned to step back and facilitate the leadership of others. I get to experience the planning aspect, too. Leading is not always from the front; someone has to be behind the drop or behind the curtain making things happen."